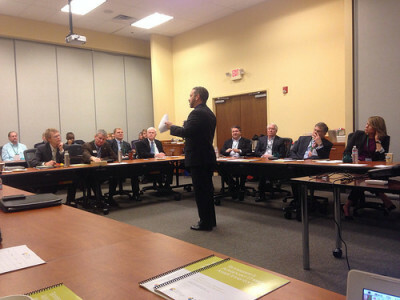 A full representation of Tennessee’s advanced energy sector participated in the February 2014 listening session, held in LaVergne, Tenn. Industries represented include energy management, energy efficiency, energy conversion, waste to energy, renewable energy transmission, sustainability, solar, LED lighting, transportation, lending, holdings, real estate, law, engineering, state government, manufacturing, higher education and the City of Nashville. Our featured guest was Mike Carr, Principal Deputy Assistant Secretary of the Energy Efficiency and Renewable Energy office of U.S. Department of Energy. After presentations given by Schneider Electric, the U.S. Department of Energy and Cortney Piper of the Tennessee Advanced Energy Business Council, a dynamic discussion centered around TAEBC and its mission to promote advanced energy as a job creation and economic strategy. Attendees agreed that TAEBC’s ability to connect assets with business opportunities is a key-differentiating factor from other organizations. Those in attendance acknowledged that advanced energy is an economic driver and increasing awareness of that is valuable. DOE invited a TAEBC delegation to Washington, D.C. at the Chattanooga listening session. This was discussed at the LeVergne listening session and it was agreed by attendees that would be a valuable experience for members. Attendees agreed that TAEBC providing information and expertise to TVA policy would be valuable. TAEBC has hit the nail on the head regarding communicating with businesses and policy makers. TAEBC can be used to foster the business/policy interactions and help remove industry barriers. TAEBC should partner with various departments in state government to host a roundtable with members and the commissioners to discuss what regulations pose unnecessary barriers. In conclusion, attendees were very supportive of TAEBC, focusing on its ability to connect with businesses, work with policy makers to reduce barriers and partner with DOE.